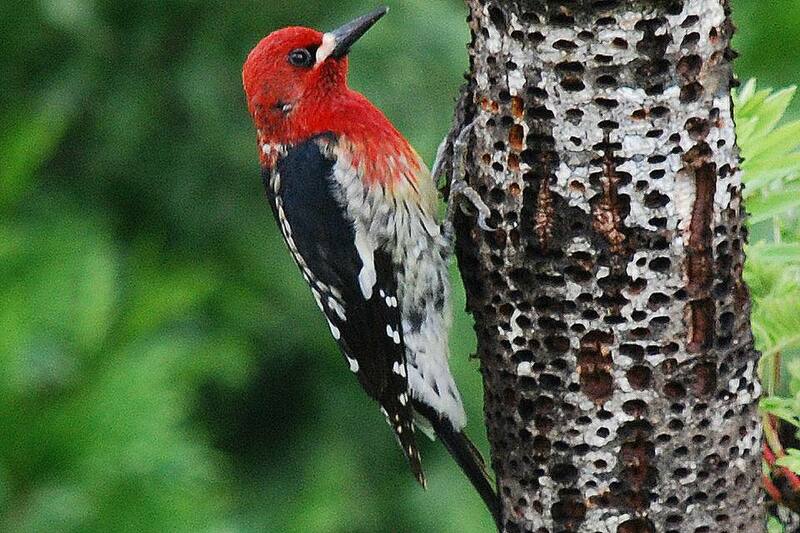 A medium-sized woodpecker, the red-breasted sapsucker was formerly considered the same species as the yellow-bellied sapsucker and the red-naped sapsucker, but all of these birds have now been split into distinct species. Knowing what makes each one unique is a great way for birders to learn more about these colorful woodpeckers. Markings: Genders are similar with a bright red hood that extends to the throat and upper breast. A white or buff patch at the base of the bill may extend to a moustache appearance on some birds. The black back has small buff-yellow spots down the center, and the black wings have a bold white patch along the edge. The rump is white, and the abdomen is yellow or whitish-yellow with fine black streaking. The undertail coverts are white with black streaks. The forked tail has black outer feathers and white inner feathers with black barring. The lower abdomen can appear grayish. The color intensity can vary between different populations and subspecies, and southern subspecies typically show more white than northern birds, particularly on the back. Juveniles are much more brownish overall, with a dark red wash on the face and breast. A white moustache is more pronounced on juvenile birds. These woodpeckers prefer moist forests with either coniferous or mixed coniferous and deciduous trees, particularly aspens, ponderosa pines, spruces and hemlocks. Red-breasted sapsuckers are found year-round along the Pacific coast from southern Alaska through coastal British Columbia and Vancouver island and as far south as the western portions of Washington and Oregon as well as northern California. In summer, their breeding range expands slightly further north and significantly more inland throughout British Columbia. In winter, these woodpeckers move further south to southern Nevada, southwestern Arizona and northern Baja. Vagrant sightings are rarely recorded much further inland than this bird's expected range, including as far east as Texas. While not all of these woodpeckers migrate, mountain populations generally stay at mid- or low-level elevations, and will altitudinally migrate to avoid the harshest northern winter weather, even though they stay within the same year-round range. These woodpeckers are usually silent except when courting mates. The typical call is a sharp, drawn-out mew that may have a piercing quality. The drumming pattern is usually relatively slow, with slightly faster beats in the beginning and an irregular overall pattern that includes both single and double beats toward the end. These woodpeckers are generally solitary or may be found in pairs. In flight, they have an undulating pattern of rapid wing beats interspersed with brief glides. They use a variety of foraging techniques, including probing, gleaning, stripping bark to encourage sap flow and drilling an even series of holes they can revisit for sap and insects. Different birds will also visit those sap wells, including hummingbirds, warblers and other woodpecker species. These woodpeckers are monogamous and generally nest either alone or in small colonies. They are cavity-nesting birds and the male partner excavates the cavity, usually from 15-100 feet above the ground with a 1.5-inch entrance hole. No nesting material is typically used, but a few wood chips may remain in the nesting cavity after the excavation. The eggs are plain, matte white and may be either oval or elliptical. There are 4-7 eggs in each brood, and both parents share incubation duties for 12-13 days, though the exact ratio of how much incubation time the male or female parent has is not well studied. After the altricial young hatch, both parents feed the chicks for 25-29 days, and after the young birds leave the nest, the parents continue to offer guidance as the young woodpeckers learn to drill their own sap wells. Only one brood is raised each year. These woodpeckers easily hybridize with red-naped sapsuckers and yellow-bellied sapsuckers. These woodpeckers may visit backyards where large nectar feeders are available, as well as suet feeders or fruit trees. Mature trees and snags can also attract red-breasted sapsuckers. While these woodpeckers are not considered threatened or endangered, they have historically been persecuted as orchard pests, since frequent sap well drilling can eventually kill trees. Red-breasted sapsuckers are now protected from such persecution, but logging activities and snag removal still pose a threat to their overall population numbers. Preserving snags is essential to protect nesting areas.